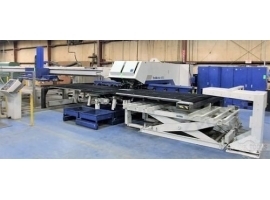 Machines name punching nibbling machine stock-no. 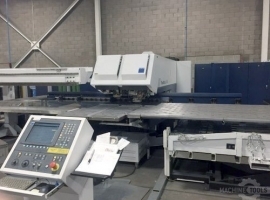 KOMKNE15 manufacturer TRUMPF TYPE TC600L1300 Year 1998 laser power 2400 W TLF 2400 turbo incl ContourLas Bj 2003 Siemens Sinumerik 840D operating hours at a current 1.28.2014 48374 h 43888 h machine laser punching a 9043 h force 22 tons traversing komb.Stanz-/Laserbetrieg XY 2585 ​​x 1280 mm travel range laser operation XY 3085 x 1280 mm travel range punching operation XY 3085 x 1370 mm max. 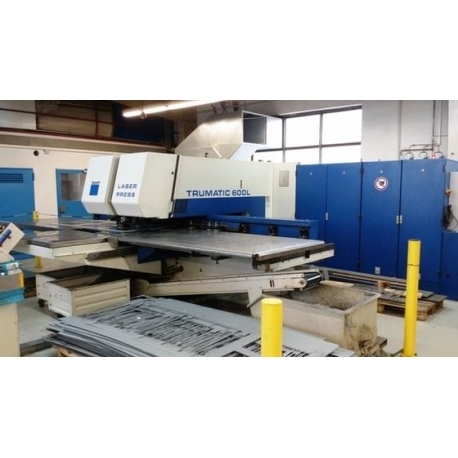 Plate thickness 8 mm max. 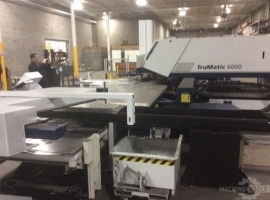 Punching diameter 76.2 mm max. 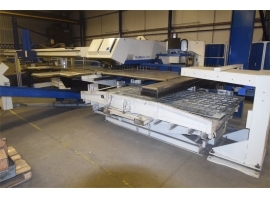 Workpiece weight 200 kg Number of tool stations 18 Length 7500 mm Width 7800 mm Height 2400 mm Weight 16700 kg Standard Equipment Advanced laser equipment 7.5 "cutting head retrofitting refrigeration unit with R407C (by KKW Riedel) AufwÃ¶lbungserkennung Advanced punching equipment MultitoolansteÃ¼rung tapping signing Softpunch Additional Equipment third clamping claw chips conveyor with container Netzwerkaunschluss Special sheet metal machining blow-out interface trump SheetMaster-machine multi-tool control thread forms Softpunch Manuals The machine is in very good condition and is fully functional capability (changes and errors in the technical data, specifications and prices subject to prior sale!) The data are mechanically translated in the english language. Translation errors are possible. No guarantee for printed data and pricing.